Hi, all! Yay, it’s Friday! Guess what I’m doing to kick off the weekend? Dishwasher shopping!!!!!!! WOOHOO! I’m taking my mom to help me even though she doesn’t own a dishwasher herself…..lol My baby daddy won’t go, because he feels stupid around appliances he knows zilch about. Right now he’s the dishwasher so he’ll be happy with pretty much whatever I get. So it’s Flashback Friday around these parts and I have a mani to show you that I did last summer for my beach trip. It actually is the exact gradient I used for my header. I just really love those two colors together. Beach manis are my absolute favorite to do. The possibilities are endless- gradients, mermaid scales, anchors, seashells, whatever floats your boat. For this particular nail art, I started out with Silver Stilettos by Milani on my ring finger. All the other nails got painted with Going Coastal by Octopus Party Nail Lacquer and then gradientized with Pea by Sally Girl. When Silver Stilettos was dry, I laid down a mermaid scale nail vinyl from Neverland Lacquers and sponged the gradient over it. Some doodads from Born Pretty rounded out this nail art nicely! By the way, my Born Pretty code is LESLIEW10 for 10% off. You can find a fun time with Octopus Party at The Octosquad on Facebook. There’s discussion of all things octopus! Plus Dave of OPNL makes a killer polish. Thank you all for stopping by the blog today! It’s much appreciated! I can’t stand the beach, but I adore mermaid nails! This is a winner! Well these are just the most perfect mermaid nails!! Thank you! I love doing mermaid nails! These nail charms are so perfect! Did you get a dishwasher you liked? I have it narrowed down to two. I’m going to pick by Wednesday! Gorgeous gradient and mani. 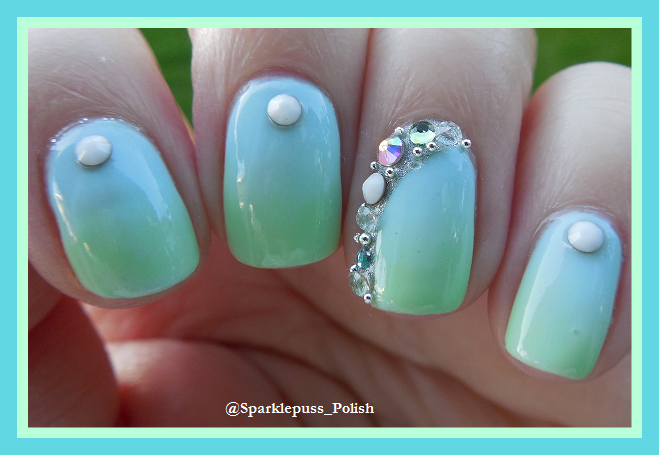 Mint / sea foam greens are perfect for beach-themed nail art. Lol at the weird things we get excited about as adults. I really love your beach themed mani!